The drive motor of this machine uses ABB product. The equipment is very important in the wafer production line. The wafer baking system uses natural gas to heat the baking plate.The machine is controlled by PLC of Japan, and the function of the oven is to automatically fill the batter with baking sheet until the baked wafer is baked. The machine is evenly baked and produced a quality wafer for further processing.A PID controller is used to automatically control the temperature of the oven.The acquisition of signals required by the controller is provided by an infrared temperature detector produced by the United States Raytek Company. Ovens operating state observation and data change Settings, provided by a touch screen. The main pneumatic components are provided by FESTO or SMC products. The drive motor is supplied by the SEW product. The bottom of the oven is equipped with automatic cleaning device to clean powders. Total number of plates: 27. Heat preservation material: aluminum silicate or calcium silicate plate. Output: the standard output per minute is 7 to 8 pieces. Generally 96 balls on each piece. Gas consumption (LNG) : 30m3/h. This machine will send baked wafer cakes into the cooling channel. Gently pass and sweep the powder on the wafer cakes, which ensures the hot wafer cakes will not easily damaged. All transmission parts are made of stainless steel or food sanitation materials. The machine improves the natural cooling effect of wafers. The machine is used to mitigate the effect of thermal stress on wafers during baking. If the wafer piece can not be cooled softly, it will be easily broken due to the impact of thermal stress due to minor collisions. All parts contact foods are made of stainless steel and food grade materials. Power supply: mechanical transmission from the oven. The role of this machine is for unsatisfied wafers cake and the subsequent machine fault collection. 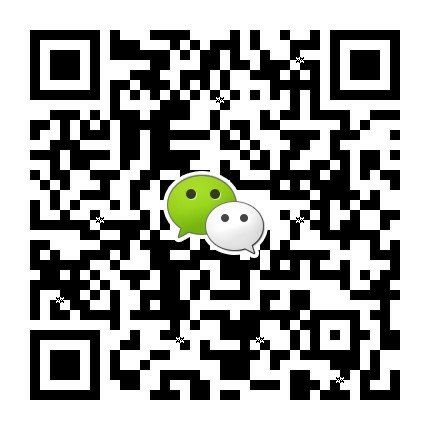 If the corners of the wafer cake coming out of the oven are incomplete or broken,After the photoelectric switch is determined, it will be automatically discharged to the collection tank;If there is a temporary failure in any part of the coating machine or cooling chamber of the wafer production line, after receiving the PLC instruction, the machine automatically collects qualified cakes continuously discharged from the oven.After the fault is completed, the wafer cake slices will be put into use again. The main pneumatic components are supplied by FESTO or SMC. The drive motor is provided by the SEW. The machine is specially designed for applying shaped hollow wafers.When the photoelectric switch detects the wafer, the photoelectric signal changes the direction of the five-way valve, and the cream blade rotates to rise. The blade of the scraper tangentially contacts the coating drum to continuously scrape off the cream on the surface of the rotating coating roller. 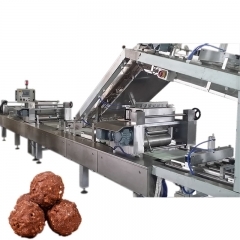 The squeezing cream is evenly covered with a uniform moving cake like cloth, two flat scraping blades with a heating device at the rear of the machine, and the cream (or chocolate) is scraped into the pit. Under the conveyor belt, a plastic scraper was installed to clean up the residual material remaining on the belt surface and scrape the rest of the material onto the insulation truck. The function of this machine is to make the approximately round nuts with approximately the same size of φ8~10 fall into the pits of the semicircle cake. 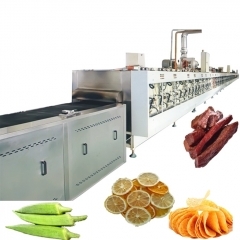 This machine consists of three parts: sprinkle nuts device, blanking device,Conveyor belt device. The movement theroy: When a photoelectric switch on the conveyor detects a tower-shaped wafer, the cylinder of the lower nut mechanism starts delayed.At this time, the cake has been blocked by the flap mechanism directly under the mechanism of the lower nuts.The nuts on the lower kernels are just in the pits of the tower-shaped cake slices, and then the flap mechanism moves to release the cake slices and complete a cycle action. The pies arranged in teams are coated with chocolate. Into the stacking mechanism, firstly, by separating the conveyor belt,Because the speed of the separation conveyor belt is faster than that of the coated conveyor belt, the pie slice was pulled apart.Behind the separation conveyor belt is a laminated conveyor belt, and an optical switch is installed above the laminated conveyor belt. When this photoelectric switch detects the first cake,the first stack cylinder operates, the rear flap flaps turn up, turn the first pie about 30 degrees. When this photoelectric switch detects the second cake, The second stacking cylinder and the third stacking cylinder are delayed at the same time, front and rear flaps flip,The first and second wafers are flipped and laminated to complete the stacking action of the wafers. 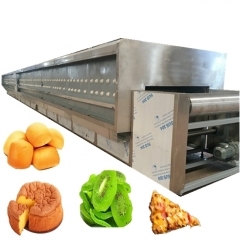 Laminated cake out of the shaper is not neatly arranged around, vertical and horizontal scraping of the cake by the pie alignment machine, The laminated cakes are aligned around and excess filling is scraped off. After the flat cake press, there are also fillings around the cake. The scraping of the cake is longitudinally scraped by the cake alignment machine, and excess filling around the cake is also scraped off. The cakes are aligned and aligned by the machine to scrape the cake vertically and horizontally, and the cakes are clean and tidy. The machine is divided into two parts: conveying and pressing. When the photoelectric switch detects the cake, the conveyor belt delay stop. At this time, the cake just under the cake,Driven by the cylinder,The pressed cake is pressed downward and the cake is compacted to the set thickness. 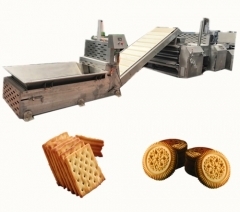 The machine is used to harden the cream layer, makes the the cream layer and wafer cake integrated closely and cuts into pieces, If the two do not combine firmly before cut, it is easy to separate wafer cake and cream layers, which causes an increase in the defective rate during the cutting process. 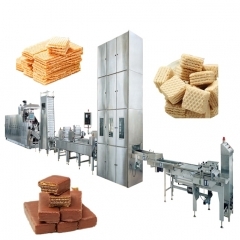 The vertical cooling machine allows the cooling temperature to be adjusted according to the nature of the cream used to produce the cream wafer. The operating time of the wafer cake in the vertical freezer is between 10-20 minutes. All shells are made of N304 stainless steel or PB plates for inside walls (refrigerator inner wall materials), The in-and-out transport belts use food grade PVC cords to transport the wafers. For the cooling required for the wafer to cool. The performance of the cooling equipment is based on the the capacity of equipment,the type and weight of sandwichand and designed to meet the climatic conditions of the installation.The refrigeration unit uses Freon R22 as a refrigerant.